Acqua di Parma Blu Mediaterraneo Fico di Amalfi Revitalising Body Cream is an invigorating body cream for senses and skin. Fico di Amalfi Body Cream captures this sensation with a mingling of sparkling notes of tangerine, lemon, orange, and grapefruit, along with the intensity of fig nectar accord. Amalfi Fig has taken inspiration from the beautiful Amalfi coastline and this body cream is a luxurious cream that instantly hydrates, replenishes and comforts the skin, like the heat of the sun and the clear blue water of the coastline from which it was inspired. 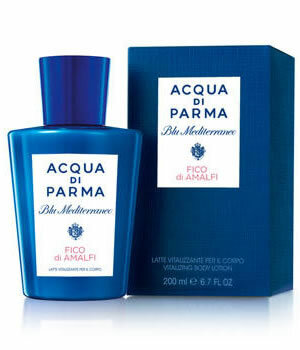 Acqua Di Parma Blu Mediterraneo Amalfi Fig Revitalising Body Cream is a particularly rich emulsion based on a combination of sweet almond oil and vitamin E and is immediately absorbed into the skin. Blu Mediterraneo Amalfi Fig Revitalising Body Cream it also has a complete revitalising effect due to the pure fig extract, while also leaving the skin silky smooth.